University of Illinois design students created immersive reality scenarios to help people who are soon to be released from prison meet certain challenges, such as learning to pay at the pump for gas. CHAMPAIGN, Ill. — Graphic design and industrial design students at the University of Illinois created immersive reality scenarios to help people who are soon to be released from prison learn how to navigate public transportation, pay at the pump at a gas station or order from a digital kiosk at a fast-food restaurant. They were learning design process during a spring semester course and, at the same time, learning how to empathize with the potential users of the product. They worked with Rebecca Ginsburg, a U. of I. professor of education policy, organization and leadership and of landscape architecture, and the director of the U. of I.’s Education Justice Project. The project offers educational programs, including upper-division college courses, to men incarcerated at the Danville Correctional Center in Danville, Illinois. Ginsburg met with the class several times and talked about the issues related to people who were re-entering society. She also met with alumni of the Education Justice Project who came up with suggestions of situations in which they could have used help handling a particular challenge. 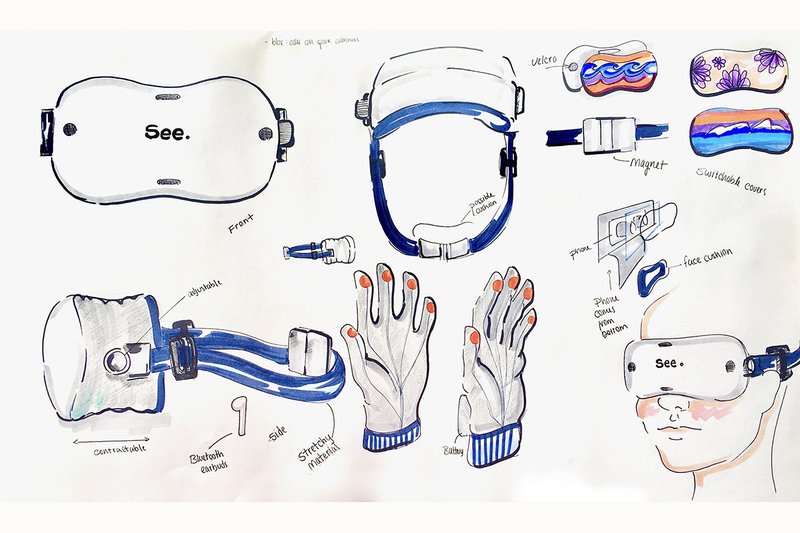 The students designed a headset and controller for the immersive reality scenario before designing the interactive experience itself. Those in the course worked on teams that included both graphic design and industrial design students. 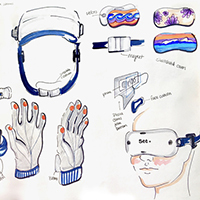 They first designed a headset and controller for the immersive reality scenario. Concerns included making the headset comfortable and also easy to get off, in case a user panicked while wearing it. Then the teams designed the interactive experience itself. Some of the experiences were meant to be fun, such as deciphering coffee-shop culture and “the way we order a drink at Starbucks and all the words we string together,” Mercer said. Others involved scenarios such as dealing with conflict with other people in everyday situations or using the self-checkout lane in a grocery store. 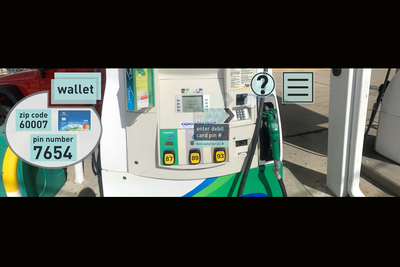 The immersive reality scenarios take the user through each step in a process – for example, choosing whether to pay for gas with cash or a credit card; providing information such as a ZIP code if paying with a card; selecting the fuel grade; putting the nozzle into the tank; and dealing with problems such as a credit card being declined. To prepare for designing the virtual reality experience, the students talked about understanding the perspective of the potential users. “We were having conversations on privilege, ethics, diversity and inclusion we don't always get to have,” Mercer said. Ginsburg said it was important for the students to understand that people just released from prison often feel inhibited and vulnerable when it comes to engaging with the outside world. Designers are concerned with human factors such as comfort and ease of use, as well as aesthetics, Bullock said. “A renaissance of design thinking” in industry is creating new opportunities for designers to be involved with problem-solving, and the project will help prepare them for jobs in user interface or user experience design, he said. Ginsburg said immersive reality experiences could be helpful as part of a comprehensive re-entry program. She said the project provided an opportunity to talk with students about incarceration and the issues associated with re-entry. She was pleased with the students’ efforts on the projects. “I feel like many of them were going beyond their comfort zones. Many of them really took it to heart and engaged in the project with a lot of concern and a lot of compassion,” Ginsburg said. Editor’s notes: To reach Lisa Mercer, email lemercer@illinois.edu. To reach William Bullock, email wbullock@illinois.edu. To reach Rebecca Ginsburg, email rginsbur@illinois.edu.